Could We Possibly Have an 825 HP Challenger SRT Hellcat? And will it pass emissions standards? The 2015 Dodge Challenger SRT Hellcat has ruled the road this summer, ever since Dodge blew us away with its horsepower rating: 707 hp. But what if we told you that we might be actually getting more than we bargained for, that we’ll actually be seeing an 825 hp Challenger SRT Hellcat hitting dealer lots? 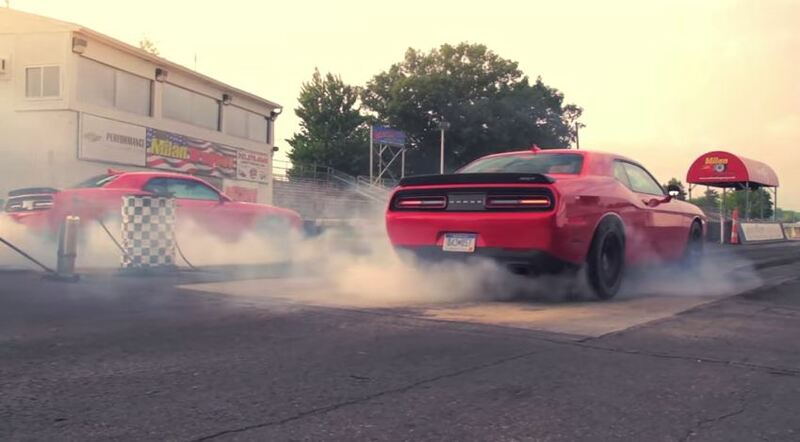 We were expecting 707 hp, but it sounds like we may be getting an 825 hp Challenger SRT Hellcat. According to Jalopnik, a source within Fiat Chrysler Automobiles says that the Hellcat has actually been dyno tuned at 825 hp (though the average driver is likely to get about 630 hp). In fact, the source, who is reportedly in a good position to make these claims, says he isn’t really sure where the 707 hp number even came from. Maybe marketing just thought it had a nice ring to it. The downside to this potential 825 hp Challenger SRT Hellcat is that it may have trouble meeting emissions standards. At least, according to this mystery source, it’s an issue. Autoblog took the initiative and reached out to Dan Reid of SRT, who would only say, “It’s totally speculation,” and “They are totally speculating about that.” Way to answer without really answering, Dan. Nevertheless, we’ll have our answer here soon. The Hellcats begin shipping to dealerships in the coming weeks, so Dodge and SRT should be done “speculating” any day now.